This SDO image (AIA 193) shows an M9-class solar flare erupting on the Sun's northeastern hemisphere at 03:49 UT on Jan. 23, 2012... just 4 days after a previous strong CME that sparked aurora around the world on the 22nd. More geomagnetic activity is expected for the 24th. This story was updated on Jan. 24 at 12:42 p.m. EST. Update: See the latest news and photos of the solar radiation storm in our new story here. A powerful solar eruption is expected to blast a stream of charged particles toward Earth tomorrow (Jan. 24), as the strongest radiation storm since 2005 rages on the sun. Early this morning (0359 GMT Jan. 23, which corresponds to late Sunday, Jan. 22 at 10:59 p.m. EST), NASA's Solar Dynamics Observatory caught an extreme ultraviolet flash from a huge eruption on the sun , according to the skywatching website Spaceweather.com. The solar flare spewed from sunspot 1402, a region of the sun that has become increasingly active lately. Several NASA satellites, including the Solar Dynamics Observatory, the Solar Heliospheric Observatory (SOHO), and the Stereo spacecraft observed the massive sun storm. 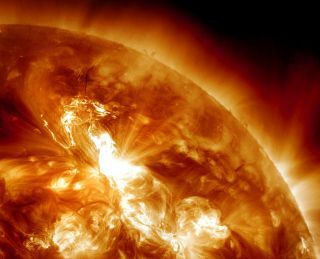 According to NOAA, this is the strongest solar radiation storm since May 2005, and as a precaution, polar flights on Earth are expected to be re-routed within the next few hours, Kathy Sullivan, deputy administrator of NOAA, said today at the 92nd annual American Meteorological Society meeting in New Orleans, La. The NOAA-operated GOES-15 spacecraft captured this X-ray image of a massive solar storm on Jan. 23, 2012. Scientists call these electromagnetic bursts "coronal mass ejections" (CMEs), and they are closely studied because they can produce potentially harmful geomagnetic storms when the charged particles rain down Earth's magnetic field lines. In addition to generating stronger than normal displays of Earth's auroras (also known as the northern and southern lights), geomagnetic storms aimed directly at our planet can also disrupt satellites in orbit, cause widespread communications interference and damage other electronic infrastructures. "There is little doubt that the cloud is heading in the general direction of Earth," Spaceweather.com announced in an alert. "A preliminary inspection of SOHO/STEREO imagery suggests that the CME will deliver a strong glancing blow to Earth's magnetic field on Jan. 24-25 as it sails mostly north of our planet." Sunday's solar flare was rated an M9-class eruption, which placed it just on the verge of being an X-class flare, the most powerful type of solar storm. M-class sun storms are powerful but mid-range, while C-class flares are weaker. NASA routinely monitors space weather conditions to determine any potential hazards to the astronauts aboard the International Space Station. Based on the agency's assessment, the six spaceflyers currently living and working on the orbiting outpost are not in any danger, said NASA spokesman Kelly Humphries. "The flight surgeons have reviewed the space weather forecasts for the flare and determined that there are no expected adverse effects or actions required to protect the on-orbit crew," Humphries told SPACE.com in an email. Last week, a separate sunspot group unleashed several M-class flares, and SDO scientists said these types of flares are occurring almost daily as the sun's rotation slowly turns the region toward Earth. The sun's activity waxes and wanes on an 11-year cycle. Currently, our planet's nearest star is in the midst of Solar Cycle 24, and activity is expected to ramp up toward solar maximum in 2013. Editor's note: If you snap an amazing northern lights photo, or other skywatching image, and would like to share it for a possible story or gallery, please contact managing editor Tariq Malik at tmalik@space.com. OurAmazingPlanet staff writer Brett Israel (@btisrael) contributed to this report from New Orleans, La. Follow SPACE.com for the latest in space science and exploration news on Twitter @Spacedotcom and on Facebook.